Pok Pok is the creation of chef/owner, Andy Ricker who fell in love with [easyazon_link identifier=”1607745232″ locale=”US” tag=”theyum-20″]Thai food[/easyazon_link] and culture during his first visit to the country in 1987. Since then Andy has returned to [easyazon_link identifier=”1780051611″ locale=”US” tag=”theyum-20″]Southeast Asia[/easyazon_link] every year in order to eat, cook, learn and experience all he can about the local cuisine and bring some of the exotic magic back to North America. 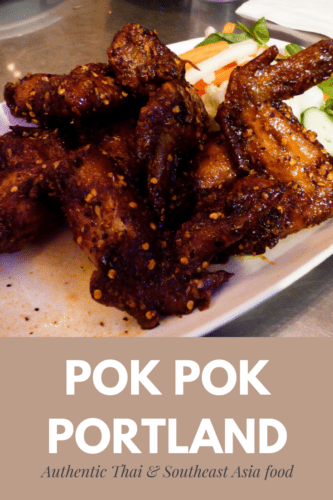 There are several Pok Pok locations in [easyazon_link identifier=”1628873000″ locale=”US” tag=”theyum-20″]Portland[/easyazon_link] and one in [easyazon_link identifier=”1628872764″ locale=”US” tag=”theyum-20″]New York City[/easyazon_link] and I recently visited the original Portland location with much anticipation. After spending a few months in Chaing Mai last year I too had fallen in love with the street food scene and had heard that [easyazon_link identifier=”1607742888″ locale=”US” tag=”theyum-20″]Pok Pok[/easyazon_link] offered some the most authentic northern Thai food around. I was not disappointed. Menu: Many of the dishes at Pok Pok are quite different to the usual fare found at most North American Thai restaurants. Not that there’s anything wrong with Americanized Thai food, I am a big fan of it myself, but at Pok Pok, the aim is to reproduce the more traditional street food and food culture as authentically as possible. Food here is best eaten family style, meaning that a table will order several dishes to share. The general rule is two dishes per person plus sides of sticky, coconut or Jasmine rice. I am personally a huge fan of sharing plates whatever the food type as I love to try as much as possible. Thoughts: This original Pok Pok location started as a very modest shack with a walk-up, take-out window. Over the years it has expanded in stages creating an eclectic selection of individual seating areas including a patio, a lounge, a dining room and a bar. A full menu is available in all the seating areas but be prepared for a bit of a wait on any night. Don’t want to wait for a table? No problem, takeout can be ordered online although you’ll be missing out on the full experience of the Pok Pok environment. Once seated we suggest ordering a creative Pok Pok Cocktail ($11) to sip on as you peruse the menu. The Tamarind Whiskey Sour and the Salted Plum Vodka Collins were both delicious but there is a good list of other tasty libations both with and without alcohol including the traditional Pok Pok Som [easyazon_link identifier=”B008E0MRRM” locale=”US” tag=”theyum-20″]drinking vinegars[/easyazon_link]. The food menu is not overwhelmingly large but it may be unfamiliar to those who are used to the more common American Thai restaurants. Luckily the staff is very helpful in explaining and recommending dishes based on your likes. However, if you have been to Southeast Asia, especially the northern parts of Thailand[easyazon_link identifier=”1465441301″ locale=”US” tag=”theyum-20″]Thailand[/easyazon_link], you will be excited to see some of your favorite dishes which you’ve probably been craving ever since (as we were). We were a group of four that evening and we started with two orders of Ike’s Vietnamese Fish Sauce Wings ($15.50). These huge and incredibly delicious wings are marinated, deep fried and tossed in caramelized fish sauce and garlic and served with perfectly pickled vegetables. One of our favorite dishes in Chiang Mai was Khao Soi so we couldn’t resist going for two orders to share next. The traditional northern Thai curry noodle soup ($15.50) was just the right amount of creamy, coconutty and mildly spicy and came incredibly close to the Khao Soi we would get at our fave stand in the local market. We completed our meal with Kaeng Hang Leh (Northern Thai sweet pork belly and pork shoulder curry at $15.50), Da Chom’s Laap Mueang (spicy hand-minced pork “salad” at $17) and two sides of coconut rice ($3.50) and were thrilled with every bite. Sadly we were all too full to try dessert but the menu was very tempting. The Khao Niaw Mamuang (a version of the popular mango sticky rice) and the Coconut Ice Cream Sandwich both looked amazing as did the impressive selection of after dinner drinks like the Whiskey Soda Float ($7). Price Range: Drinks go from $4-11. The shareable dishes run from $9-24 with the most common price being $15.50. Desserts and after dinner drinks range from $7-9. If you’re looking for good hotel recommendations in Portland, we recommend these. Sarah is a travel, lifestyle and food writer and runs several websites including Live, Dream, Discover and Discover the Pacific Northwest. She travels most of the year splitting her time between International destinations and her previous home of the PNW.